Another brilliant SLPS Annual Exhibition closes! 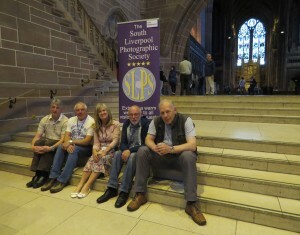 Very many thanks to all our SLPS members who have entered their work for the exhibition. I personally feel that it’s been the best show of work ever! So many members and their friends have been involved in the planning, preparations, printing, publicity and delivering all aspects of the exhibition, including our Presentation Evening. We couldn’t have achieved all of this without you! Displays have now been de-rigged, prints returned to their owners and accounts being settled. Winners of the Catalogue Draw are Denise from Southport, Alexandra from Nottingham and Gina from Liverpool 17. Delivery team – Mike, Bert. Irene, Ed and Martin take a well earned break as the exhibition closes. So now……… the delivery team are required to undertake a de-briefing so as to improve on this year’s efforts. Do please send any helpful comments to the Secretary within the next five days.